Remember the Vertical Rush? Dear God, we do. An agonising slog up all 920 stairs of the City's former tallest building. Turns out that was just a warm up. The Twin Peaks Challenge (Sunday 23 May) presents double trouble for would-be participants who must climb the steps to the top of two London towers. 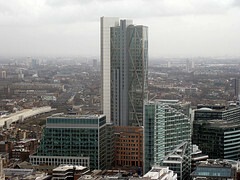 The first ascent takes in CityPoint, the curvy glass number on the edge of the Barbican, which clocks in at 33 floors. The second highrise is the Broadgate Tower (pictured), that sharp-edged white and grey monster that went up a couple of years ago near Liverpool Street (34 floors). In total, that's 1512 steps (or 1.6 times the challenge of Vertical Rush). The event is in support of Action Against Hunger. Entrance costs £35 per person and you're expected to raise a minimum of £200. Sign up here. Image by M@.